If you did not read the post, then you would probably not know that this set came with three full-sized Benefit Lip Balms and three matching Benefit Tint samples for only twenty-five dollars (smart shopper, I know). As for packaging, I think I am in love. The lip balm has such a nice packaging with the metallic light magenta color, the peppermint swirl design, and tiny dots. Benefit really knows to do packaging and this product is no exception. The product itself is said to be an warm orchid color, which I agree with. It goes really nice on darker skin-tones which is something many girls struggle with. Before I apply, I prep my lips by doing some light exfoliating with a toothbrush. If I am just going to wear the tint, I apply a lip balm before because tints are really drying on the lips. I like to kiss the back of my hand to remove any extra lip balm. 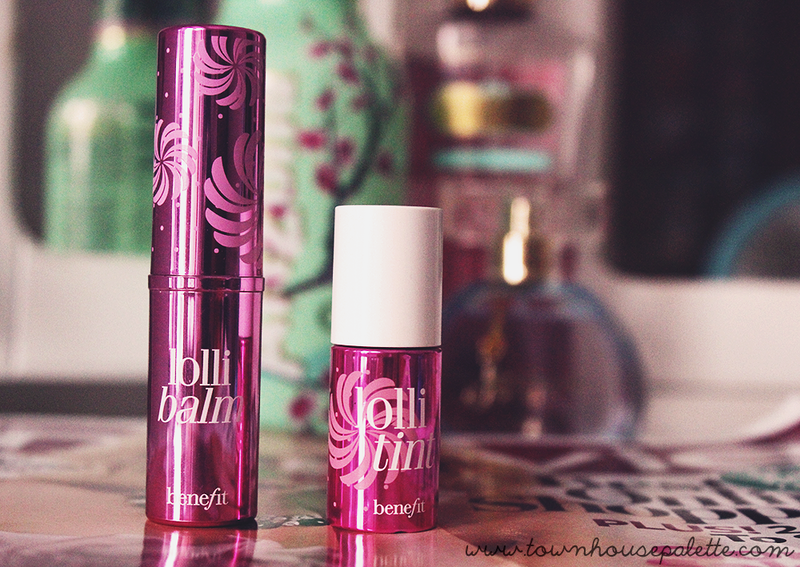 Otherwise, I will apply the Lollitint and then the Lollibalm. A really nice combination with a really nice natural look. One thing about the balm is that if you do not exfoliate, the balm will pick of little flakes of dead skin and coat them with balm. If that happens wipe it off, exfoliate, then swipe the balm on the back of your hands to remove any dead skin cells, and apply. The final is a really nice simple purple lip. 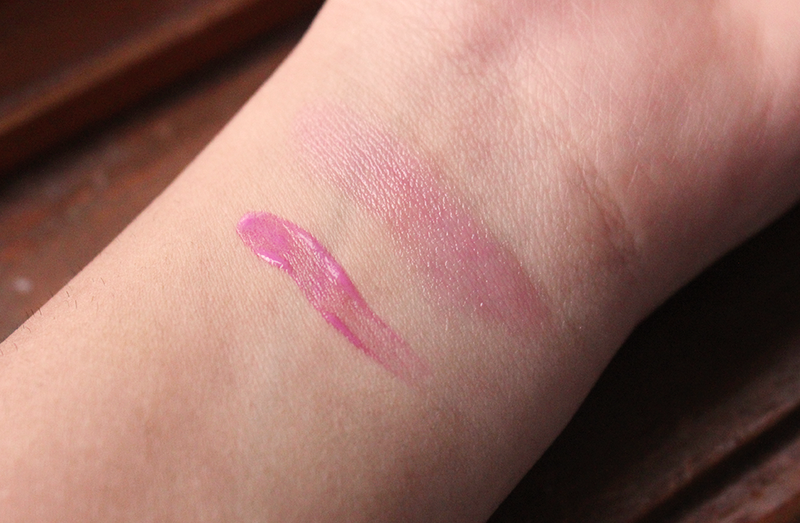 The tint has a build-able formula, that has a really nice natural finish. While the balm is more sheer and can only be built a few time before it looks like a mess. Jojoba Esters, Diisostearyl Malate, Polyglyceryl-2 Triisostearate, Dimer Dilinoleyl Dimer Dilinoleate, Synthetic Beeswax, Mangifera Indica (Mango) Seed Butter , Ozokerite, C20-40 Alcohols, Polyethylene, Parfum (Fragrance), Trimethylolpropane Triisostearate, Ethylhexyl Palmitate, Dipalmitoyl Hydroxyproline, Limonene, BHT, Linalool, Hydroxycitronellal, Citronellol, Luffa Cylindrica Seed Oil, Citral, Aluminum Hydroxide, Tocopherol, Geraniol, Trihydroxystearin, Benzyl Salicylate, Propyl Gallate, Butylene Glycol, Caprylyl Glycol, Phenoxyethanol, Sodium Hyaluronate, Hexylene Glycol. [+/-: CI 12085 (Red 36, Red 36 Lake), CI 15850 (Red 6, Red 7, Red 7 Lake), CI 15985 (Yellow 6, Yellow 6 Lake), CI 19140 (Yellow 5, Yellow 5 Lake), CI 42090 (Blue 1 Lake), CI 45380 (Red 21, Red 21 Lake, Red 22 Lake), CI 45410 (Red 27, Red 27 Lake, Red 28 Lake), CI 73360 (Red 30, Red 30 Lake), CI 77891 (Titanium Dioxide), CI 77163 (Bismuth Oxychloride), CI 77491, CI 77492, CI 77499 (Iron Oxides), CI 77742 (Manganese Violet). Aqua (Water), Ethylhexyl Stearate, Butylene Glycol, Hydroxyethyl Acrylate/Sodium Acryloyldimethyl Taurate Copolymer, Pentylene Glycol, Phenoxyethanol, Squalane, CI 77891 (Titanium Dioxide), Polysorbate 60, CI 77492 (Iron Oxides), Disodium EDTA, Tetrasodium EDTA, CI 45410 (Red 27), CI 77499 (Iron Oxides), CI 42090 (Blue 1), CI 15985 (Yellow 6). Overall, I was think this tint was not going to look good on me because of my skin color. I was really surprised how well it looked. The pictures were really washed out because of the light I had, so I have to increase the vibrancy in Photoshop. I also Photoshop-ed the skin around my lips, but the lips were untouched except for the vibrancy, brightness, and exposure. I would recommend to anyone looking to take the steps to try a purple lip or something outside their comfort box. Also, for my reviews I will be adding ingredients because a lot of websites do not give you the ingredients for products. Pretty shady if you ask me. Anyways, expect product reviews for Posie and Bene versions of these products in the next few weeks. In other news, my birthday is on Friday! Yay, to be honest I am not really excited. I really just want to go out and eat at Red Lobster. Who doesn't?